Sheila Squillante really loves you in a house so full of stupid boys this week at No Tell Motel. Joshua Ware slopes sloping slopes this week at No Tell Motel. 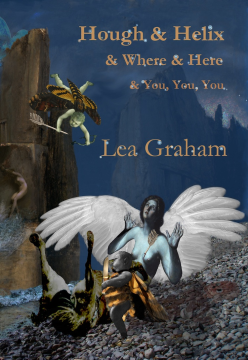 Hough & Helix & Where & Here & You, You, You, creates energy by relentlessly kneading its central questions. It mixes sophisticated word choice with images gleaned from mythology and popular culture, but these blur past the reader, like images seen through the window of a train. Lea's book will be available for purchase on August 1 at Lulu and retail outlets soon after that. Soham Patel comes into a place where all the doors remain shut for the hours this week at No Tell Motel. Tiffany Midge makes a proper demon this week at No Tell Motel.